I’m just not sure which I love more…. Ok, I promise this is not turning into a coupon blog. But I had to share this. If you click on this link for Schwan’s Foods you can order $10.00 worth of food for free. I have several friends who have done it and it is totally free. The only catch is the item must be under $10.00. So you can’t order something that is $11.50 and pay the extra $1.50. Sort of lame but oh well. I just ordered 2 lbs of Ground Beef for free and I also sent my momma 2 lbs too. They also have tons a treats for under $10 too. Now go get your free food!! Speaking of treats, do any of you read The Pioneer Woman? She has quickly become one of my favorites. She’s very witty and very down to earth, one of those people you would love to have for a best friend. 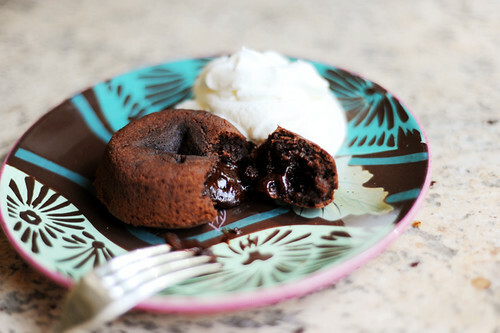 She also runs Tasty Kitchen and she recently recommended this recipe for Chocolate lava cakes. These are one of my ulitmate favorite things! So I decided to try it out last night. I was in need of some chocolate therapy. And just in case you were wondering, it totally worked. The therapy that is. The cakes too. I don’t think I have ever made an easier recipe and they were PERFECT! Seriously, you have to make these babies. 20 minutes start to finish and you’d think a professional chef had whipped them up right in your own kitchen. I’ve mentioned my new love of coupons before and I thought I’d share my latest find for saving on the grocery bill. My friend Melissa told me about this a few weeks back and I finally got around to checking it out. I’m sorry I waited so long! The company if you can call it that is called Bountiful Baskets. They are more of a non-profit/wholesale group/Food Co-op. It was started in Arizona, has grown into Utah and seems to be growing by the week. I’ve heard of community farming before where you buy a ‘share’ of a locale farm and each week you get a share of the crops, but that is a little different and is about $500 up front in the Spring. 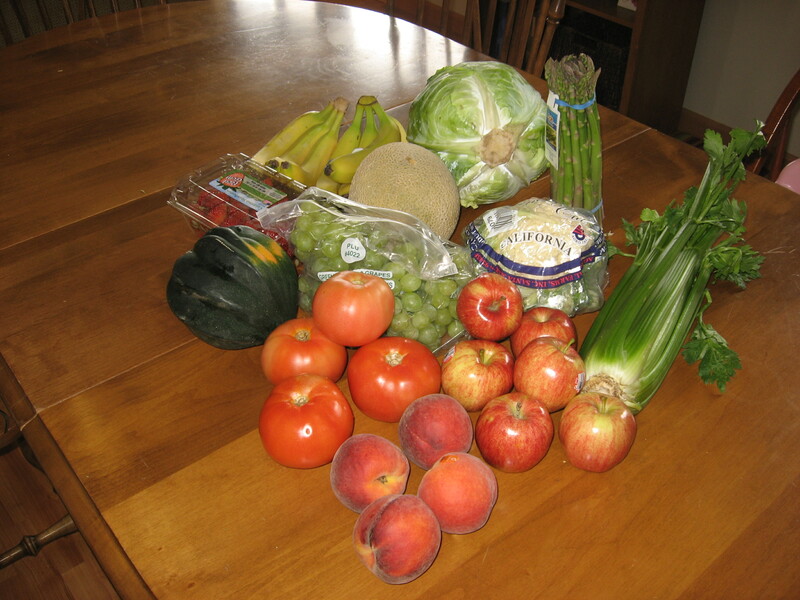 This Co-op purchase produce of all kinds at a wholesale cost and then divide it all between all of the customers. That’s not a very great explanation, so go here to read all about it. They also have bread, meat and a few other things available from week to week. Every other week you log on and place your order of how many ‘baskets’ you would like and if you would like anything extra. Last week they had bread in 5 loaf packs, tomatoes by the bushel and it looks like you can ad extra’s like the ‘Italian Basket’ has herbs, extra tomatoes, egg plant, cucumbers ect. Each ‘basket’ ends up filling a large laundry basket with produce and each week it varies exactly what you will get. Also 1 Basket is $15 and the ‘Italian Pack’ was $7 or 8. All of it was in great shape, except the tomato’s which could have been a little riper but those ripen well in my kitchen window so I’m not complaining. The other great thing about this is that there are tons of pick up locations, it looks like most of them are in Davis and Weber Counties. Pick-ups are all on Saturday morning and vary a little bit on times. I only had to drive about 6 blocks down the street to the park, fill up my laundry basket and I was good to go. I’m totally sold! I would have spent well over $30 on all this produce by the prices at Albertson’s this past week and we will use every bit of it. I just wish it was available weekly and not every other week! If anyone is interested I totally recommend it and you can get all the info you need from their website. I don’t know anyone who doesn’t like Bath and Body Works…well maybe my husband because I always spend money there. Anyway I came across this coupon today and thought I’d share. If your like me you stock up on their stuff a couple times a year and this coupon will come in really handy. You can print this one or go here and print it. I told a few of you I would post more info about my adventures in couponing, so here it is. I’ve started using coupons and following some blogs that have allowed me to get a lot of free or practically free stuff. I have over a years supply of diapers and wipes for less than $40, I haven’t paid for soap, shampoo, toothpaste, razors and pretty much all toiletries for about 6 months and I have cut our grocery’s from about $600 a month to around $250-300. Plus I’ve been able to get my food storage up to at least a 3 month supply. I gotta tell ya how great it feels to be able to do this! Honestly I’m hardly an expert and a lot of the tricks and tips I don’t even understand yet, like Walgreens and RiteAid, they are complicated. I follow a couple of blogs that I thought I would share. I have found that the deals they list are generally not right on for where I live but they are usually close. For example they will say you can use a certain coupon and the item is free. But the cost of living seems to be higher here because I usually find things priced $0.10-0.50 more than what they list. I have yet to find any local blogs for Utah except for Grocery Smarts but that is a little bit of a different program. Pinching Your Pennies I think this site is a little overwhelming and I haven’t quite figured it out. My Frugal Adventures She gives great tips on learning to start couponing. Organic Grocery Deals Don’t let the name fool you-I mainly use their Target Coupon Generator. Be Centsable Great list of tons of other sites. Coupons.com This is a great site to get coupons if you don’t get the Sunday paper but I didn’t really understand how to best use them until I started following these other blogs and learning how to maximize the coupons with sales and other coupons. Ok, that is all I have on that for now but I before I go I have to share a website with you that my cousin Heidi told me about. I have never heard of this before but I’m not very hip so maybe it’s old news. Eyes Lips Face or e.l.f. Most of their makeup is $1.00. They have a basic line, a mineral line which is about $3-4 and a pro line that is $5-8. I’m really picky about my foundations, powders and mascara but I’m all about $1 lip gloss, eye shadow, nail polish and more. Shipping is 6.95 unless you order $75+ then it’s free. Wow, that’s a lot of makeup! You can also get half off your order up to $15 right now by using the code CAROLINA. So the most you will save is $7.50 but hey it pays for your shipping, right? And if you put in the code EGKABUKP you will get a free powder brush. I have ordered a bunch of things so I’ll let you know what I think when it gets here. If anyone else has used this brand I would love to know what you think of it. oops, i forgot one thing. If you order over $20.00 they will offer you a free subscription to Women’s Health Magazine. Next to that offer is a link for more info. If you click that link it will give you the option of the Magazine or a Rebate of $9.99 that you must send in within 30 days.